When reading an e-book, one would usually use a highlight tool to mark those important words and sentences. Now, if only you could do the same whenever you are reading a blog post or web article. Well, its not like it’s not possible but in order to do so, you will need a special online tool or highlighter. 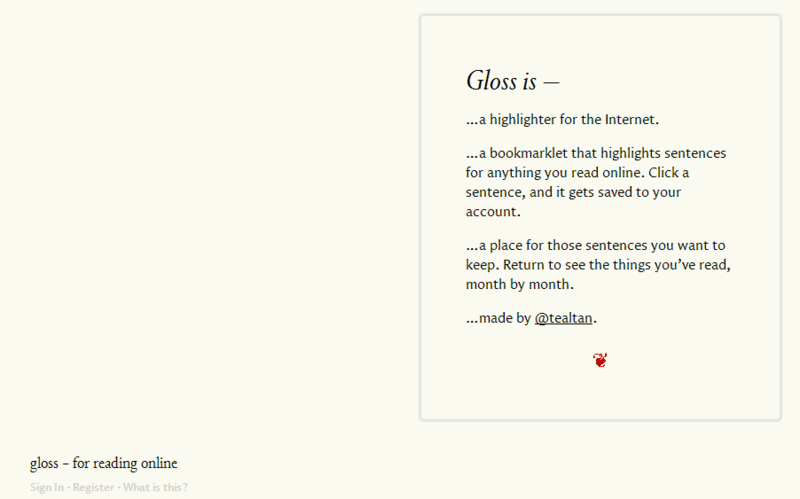 If you don’t have one, you could try using this simple web app called Gloss. 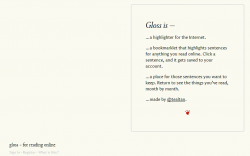 Gloss is a simple online tool that serves as a sentence highlighter and bookmarklet. What it does is that it lets you highlight those important sentences or text that you’ve read from various blog posts and web articles. The way it works is also very simple. You just need to install the bookmarklet into your browser and you’re all set. Furthermore, this web app is compatible with any type of web browser. You can use it on Chrome, Firefox, Safari, Opera, IE, etc. Neat and simple user interface – no-frills, no annoying ads, etc. Simplicity is definitely one of the strongest points of Gloss. In fact, it’s so simple that you don’t even need to worry about the way it works. With this web app, it’s like you have a classic highlighter pen that you can use whenever you’re reading a blog post or article from the internet. To use this tool, you simply need to go to its homepage (see link below) and then you register for a free account. Once you’re done, simply log-in to your account and then you will be immediately prompted to install its bookmarklet. Furthermore, you can use the bookmarklet regardless of the type of browser that you are using. Just drag it to your bookmarks bar and you are all set. After which, just browse the web normally and search for any kind of article. Click on that article and then click on your Gloss bookmarklet. Thereafter, the page that you are currently reading will automatically show you the sentences that you can highlight. These sentences will be marked in subtle yellow line so all you need to do is to click on any sentence that you want. Once you are done reading, just click the bookmarklet again to remove the highlights. Aside from this, it is also important to note that Gloss will automatically keep a copy of your highlighted text. Thus, you are free to view them again by simply logging in to your account. All in all, I find this tool very simple and straightforward. I also like its neat and minimalist UI. It’s just that some people may find this tool “too simple” since it lacks some essential tools and features like the option to change the color of your highlight. You cannot also import or export your highlights for data backup. I also noticed that it saves the highlighted sentences separately even though they’re just part of the same article or paragraph. I also find it disappointing that this tool can’t be used to mark specific words or phrases instead of the entire sentence. Gloss proves to be a very handy web app and it’s definitely great for highlighting those important quotes and sentences that you read online. It’s still far from perfect but it would be nice if its features could be improved. It would also be great if it would support more themes for its UI. So if you are looking for a simple highlighter that you can use while reading your favorite posts online, go ahead and give this free web highlighter a try.